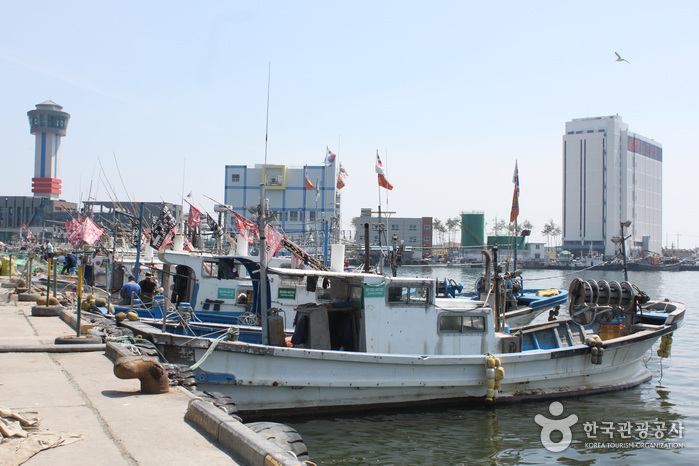 Situated in Donghae (Gangwon-do), Mukho Port (opened in 1941) and used to be the most prolific trading port on the east coast, but with the steady change in the economy, it has become a center of fishing. A large wholesale seafood market at the port offers a wide array of seafood from squid to mackerel, as well as mackerel pike, crabs, and sea squirts. From early in the morning on weekends, merchants across the country gather at the market to purchase fresh seafood. Mukho Port, in particular, is renowned for squid along with Jumunjin Port. The port, which is the largest squid market on the east coast is busy every day with boats stuffed to the brim with squid. The port is surrounded by the Mukho Lighthouse and Mukho Lighthouse Park. There are three ways to get to the park: a suspension bridge (which appeared in the popular Korean drama Shining Inheritance), a road, and Lighthouse Pathway. Lighthouse Pathway is decorated with artistic murals (with verses) and colorful signs. Donghae Regional Maritime Affairs & Port Office has made strong efforts to transform Mukho Port into a pleasant park for both tourists and residents by establishing broad squares, promenades, and leisure facilities; by 2012, the port will be the home of the largest coastal guard base after completing a port extension.